How do you like your Don Quixote? In its traditional book format? Or perhaps as an opera or ballet? Modern little literature fans like their Quixote on their iPads. Spanish media design house Touch of Classic have just released their first iPad app, aimed at bringing classic literature alive for children. And what better starting point than the Spanish classic, The Adventures of Don Quixote?! Not familiar with the story of Don Quixote? It’s basically a swashbuckling adventure full of knights, horses, nail-biting escapes, giants and jousting sticks. The story follows Alonso Quijano, a man with a big imagination who reads a few too many novels. Alonso decides to revive chivalry under the name of Don Quixote and with his recruit, ‘squire’ Sancho Panza, they embark on all sorts of fanciful adventures. Yet the ‘giants’ Alonso and Sancho fight are in fact windmills, the ‘castle’ they visit is just a simple inn and their shields, just pillows. And therein lies the humour. 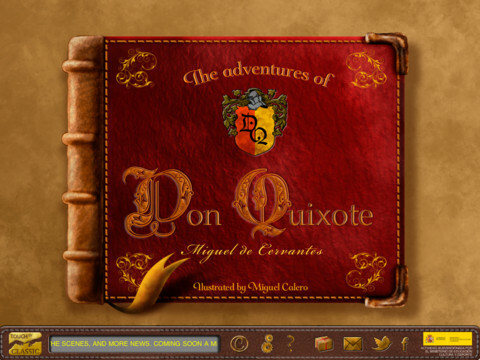 The Adventures of Don Quixote app tells the story and includes smart interactive features, riddles and puzzles. Accompanied by a fantastic original soundtrack and a cool steampunk control board it is certainly an attractive way to introduce a classic. The Adventures of Don Quixote for iPad is available for $1.99 via iTunes. Coming soon from Touch of Classic is Shakespeare’s A Midsummer Night’s Dream.